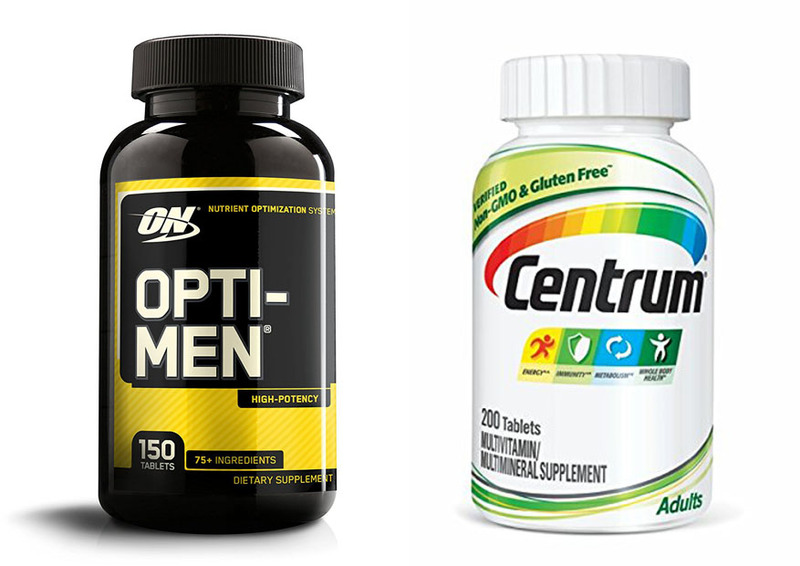 Opti Men and Centrum are two of the most popular multivitamin supplements on the market right now. However, the Opti Men multivitamin is quite more expensive than Centrum. So, is the pricier option really better than the budget one? Below, we will see the comparisons between Opti Men vs Centrum based on several factors. Continue reading to see which one is the best for you! In order to determine the quality of a multivitamin supplement, it is a good idea to start by taking a look at what the supplement actually contains. After all, a multivitamin supplement is supposed to provide the vitamins and minerals that your body needs. If we compare the labels of Opti Men vs Centrum, we can see that Opti Men is indeed a richer supplement. It comes with many more types of vitamins and minerals. It also contains various nutritional blends that can further support the body, such as the Amino Men Blend that contains several essential amino acids, the Viri Men Blend that contains stamina-enhancing ingredients, and the Phyto Men Blend that contains various antioxidants for your health. The Centrum multivitamin is quite simpler, as it does not come with any additional blend. This is a simple supplement which contains several types of vitamins and minerals. Most of the vitamins in Centrum come at lower amounts than Opti Men, most notably the levels of vitamins A, D, C, E, B-complex, and K.
Both Opti Men and Centrum multivitamins don’t contain any milk or soy product. So, even if you are allergic to milk or soy, you can still consume either of these supplements to fulfill your daily nutritional needs. However, note that Opti Men is not certified to be gluten-free. On the other hand, Centrum confidently features a gluten-free label. So, if you have any condition that requires you to avoid gluten, you should choose the Centrum multivitamin, just in case. People with gluten sensitivity or celiac disease should avoid gluten. Finally, when choosing between Opti Men and Centrum, one of the most common factors that people point out is the absorbability. There are many multivitamin supplements on the market, but they are not the same. Some are highly compressed, and as a result they are more difficult to absorb by the body. Centrum is one the more compressed multivitamins. It is not fully digested by the body. Only some amounts of the whole nutrition can be absorbed. This is why many people find that Centrum is not as powerful as Opti Men. Due to not getting absorbed properly, the effects it provides are less powerful. On the other hand, Opti Men has better absorbability. The ingredients are not too much compressed so that they can be easily digested. As a result, the users can receive more noticeable improvements on power, stamina, cognition, and overall fitness. Between the two multivitamins, Opti Men is definitely better. It comes with more types of vitamins and minerals, and it also comes with beneficial blends. It also has better absorbability to deliver more significant improvements to your body.